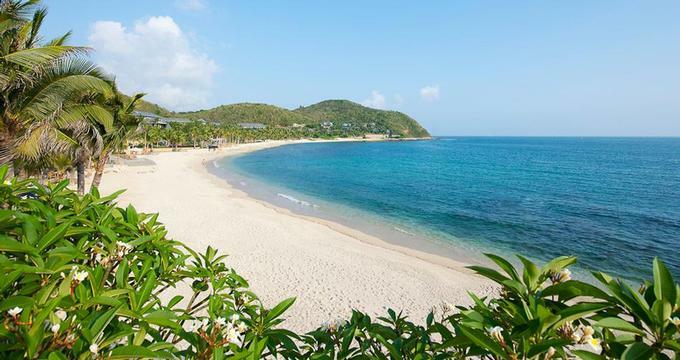 Mandarin Oriental, Sanya is a stylish beach resort located on the southern tip of Hainan Island in China. The luxury resort enjoys warm tropical weather year round so that vacationers can play outdoors. There is a set of landscaped pools, including the main Recreation Pool for families who can play volleyball, water soccer, and other pool games. If you are looking to relax and unwind on your trip, head to Tranquillo pool which has scenic sea views and calm ambiance. The hotel is set on a 1.2 km white sandy beach, the secluded Coral Bay. Lounge on the sandy bay and take walks along manicured pathways and gardens. Grab a hammock under a palm tree and watch the tranquil ocean while you take a nap. For those who like to stay fit while you travel, there is a 1.5 km jogging path around the resort that lets you enjoy scenery while your run. There are morning runs you can join organized by the fitness team. For long-distance running, there is a scenic mapped root you can pick up when you arrive. The beautiful coral reef teeming with marine life is an inviting spot for snorkelers and kayakers. There are guided snorkel and kayak tours from the resort beach which are popular with families. You can also hire a speedboat or a sailboat and explore the South China Sea or go fishing. The restaurants were designed with Coral Bay and South China Sea views. Dine under the stars, choosing from different dining venues. For a casual lunch, head to the pool bar. The hotel features an award-winning spa with a holistic approach to well-being. The secluded Spa Village features 18 treatment rooms housed in 8 beautifully appointed villas. If you are on your honeymoon, book one of the 2 VIP villas with their own private gardens. Plan a relaxing tropical getaway in China and enjoy stunning facilities, treatments from around the world, and excellent service. The resort is home to a unique wellness center and is the only resort spa in Hainan licensed in Traditional Chinese Medicine. Arrive early for your appointment to take advantage of the beautiful and extensive facilities. Enjoy stunning treatment rooms with an outdoor tub and steam shower, or book a suite with a private sauna. The two VIP villas are especially impressive, complete with a private garden and sauna. The wellness center offers TCM therapies which can address your health concerns. The center offers consultations so that you can choose treatments that best fit your needs. In addition to TCM therapies, travelers can choose from an array of massages, facials and body therapies. Each treatment begins with a relaxing foot ritual. Get married with a view of the ocean and the beach on the tropical Hainan Island in China. The resort caters to events of all sizes and can take care of every detail so that you can have a perfect day. Couples receive a complimentary honeymoon night at the luxury resort. The staff will help you with thedetails and ensure a smooth event. The resort has 5 function rooms set within individual pavilions surrounded by tropical gardens. There are 8 outdoor venues ranging from garden to poolside locations. Couples receive a number of special perks in addition to a complimentary honeymoon. You will receive Complimentary upgrade (subject to availability) , Full breakfast for two daily, VIP status, Early check-in and late check-out , A complimentary welcome drink upon arrival and a USD $100 spa voucher. Room rates start at CNY 1,600 per night.